The one thing that you guys do not know about me is I love South India food! I have a super soft corner for dosa and idlis! Each time I lose my appetite, Mr MBT knows what to make me eat! Last month on my trip to my home place, I was not eating properly for 3 days due to change in water or weather and my in-laws took me to restaurant to eat "dosa" *hahaha dosa makes me feel good* and I was feeling all good. This weekend we went to watch the movie "Traffic" in Inorbit Mall. We booked the evening show and had a lot of time to do some window shopping. But you know a girl cannot only do window shopping and yes I ended up buying few stuffs for me. As I was already tired doing shopping, we dropped the idea of going to outside restaurants as on weekends you had to wait a long time to get a table. We entered the Chutneys restaurant and luckily there were many empty tables! They had really large space and the ambience was also good! Let me show you the mouth watering dishes we ordered! 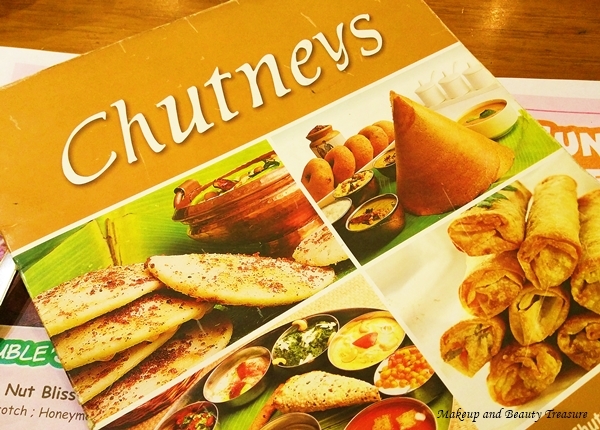 The specialty of this restaurant is they offer six different kinds of chutneys! Though I could not make out the ingredient of each chutney after tasting but the brown one is a mix of tamarind and few spices and I loved it to the core. The dosa alone tastes delicious with this chutney. The others were of peanuts, sweet coconut, garlic etc. The dosa came with the filling of panner tikka that were very yummy and I totally loved this version of dosa. The dosa was crispy and of good size! The dal was also a bit sweet and it was a perfect mix of sweet and spicy. I like adding a bit sugar in my dals and this one passed my test. I liked how dosa came on a leaf. It reminds me of a perfect south Indian dish I had in Chennai years back! I am definitely going to order it again on my next visit! 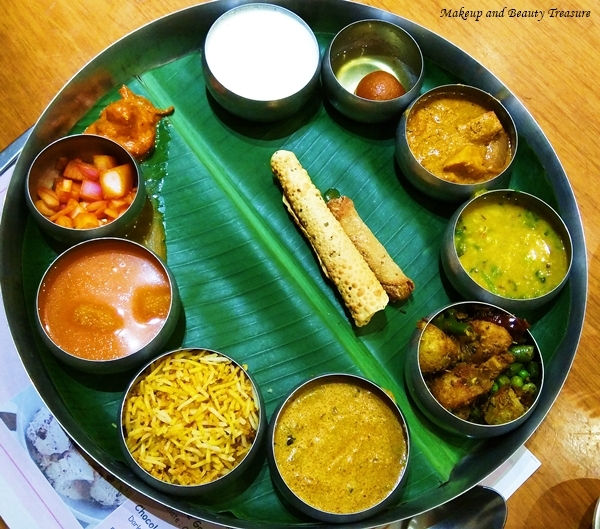 North Indian Thali comes with various curries and dals, few sweet dishes, raita, roti/puri (we opted for tandoori roti), papad, rice and ice cream. The taste was good nothing special or unique but the food tastes really good. Overall the experience was really good! I totally loved the ambience of the restaurant and the food. Though the staff was friendly but they were a bit late in attending the customers. They were busy chit chatting with each other and we had to call them to take our order. Anyways I enjoyed my food and would recommend it to everyone! It is so difficult to find a vegetarian only restaurant in Hyderabad and I was happy I explored Chutneys! Have you ever tried Chutneys? Same here Praseena. 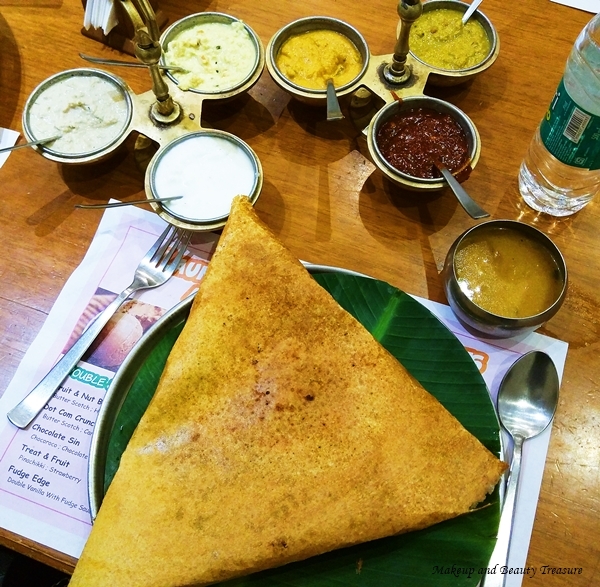 You can find south indian dishes in many restaurants!